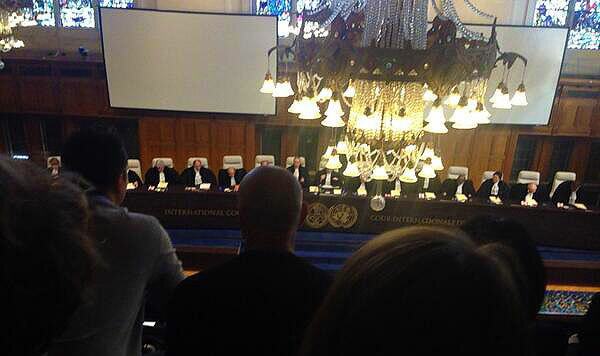 (The Hague, Netherlands – 31 March 2014) – Delivering its judgment on Australia’s case against Japan, which saw evidence presented during a three-week hearing last June, the International Court of Justice (ICJ) today found that Japan’s Southern Ocean whale hunt was illegal under international law. The World Court found Japan’s so-called ‘scientific’ whaling programme in the Antarctic failed to meet the conditions for scientific whaling under regulations set by the International Whaling Commission (IWC), the body charged with the conservation of whales and the regulation of whaling. It was ruled that no further permits for scientific whaling should be issued under Japan’s scientific whaling programme. The International Fund for Animal Welfare (IFAW), which campaigns for an end to all commercial or so-called ‘scientific’ whaling, welcomed the judgment as a major victory for whale conservation and international law. The landmark ruling means whales in the Southern Ocean Sanctuary will be fully protected from commercial slaughter conducted under the guise of science. “We welcome the court’s findings,” said Patrick Ramage, IFAW’s Global Whale Programme Director, who was in court to witness the judgment being delivered. “IFAW had long pushed for whales to have their day in court, and we are very pleased that justice has been served. “The government of Japan has a strong record of genuinely respecting international institutions and we fully expect Japan will abide by the Court’s ruling,” Ramage said. “We respectfully urge Japan, Iceland and Norway, the last three countries still killing whales for commercial purposes, to accept that whaling has no place in the 21st Century and to act in compliance with the judicial precedent set by the court today. “The market for whale meat in all three countries is in freefall; it is time they joined the rest of the family of nations in abandoning this outdated and uneconomic industry,” Ramage said. This case came before the ICJ because of two decisions by the IWC; A 1986 decision to ban commercial whaling and a 1994 declaration of the Southern Ocean Whale Sanctuary, along with 30 IWC resolutions strongly criticising Japan’s whaling and asking it to stop. Independent panels of international legal experts reviewing Japan’s scientific whaling programme have consistently found it ‘unlawful’ under international law*. Since the global moratorium on commercial whaling was introduced, Japan has killed more than 14,000 whales in the name of science, the vast majority of these in the Southern Ocean. Scientists at the IWC have never found a way to make whaling humane and little real science has been produced from the slaughter of whales. Scientific analysis of footage of Japan’s whaling in the Southern Ocean has shown whales taking more than half an hour to die. Non-harmful research on live whales, by contrast, is producing valuable data and IFAW encourages Japan to join Australia, Brazil, the US and others in the Southern Ocean Research Partnership, which coordinates scientific research on Southern Ocean whales and their environment using effective benign techniques. IFAW works in whaling countries to promote whale watching as a humane and sustainable alternative that is better for whales and for coastal communities. For more information or to arrange interviews with IFAW experts please contact Clare Sterling at IFAW on +44 (0)20 7587 6708, mobile +44 (0)7917 507717, email csterling@ifaw.org or alternatively contact Patrick Ramage in The Hague on +1 (508) 776 0027 or Vassili Papastavrou, also in The Hague, on +44 (0)7801 613514. Skype interviews can also be arranged on request. * IFAW has previously convened a series of legal panels (between 2006 and 2009) in response to the escalating scale of scientific whaling by Japan, coupled with the inability of the International Whaling Commission (IWC) to address the issue of scientific whaling, in part due to Japan’s tactic of “vote consolidation” at the IWC. The Environmental Protocol of the Antarctic Treaty.